This a movie review of THE GOOD DINOSAUR. Pixar making a dinosaur Western might have been a spectacular idea had the filmmakers gone down the route of HEAVEN’S GATE: An animated revisionist epic tackling heavy themes. The creative powerhouse was already up against a cartoon Wild West gem in RANGO. For the first time, Pixar has delivered two films in a single year. Coming off one of their best, INSIDE OUT, unfortunately quality control has not reigned; THE GOOD DINOSAUR rivals CARS 2 and BRAVE as one of their nadirs. Storytelling here ranges from the tired to the bizarre. It is unclear why this project was not put out of its misery a lot earlier in its gestation period; a not unprecedented move, e.g. NEWT was axed. ​Existing in a parallel universe, imagining the meteorite that killed off the dinosaurs 65 million years ago missing Earth, we meet a modified collection of the planet’s inhabitants millions of years later. Henry (Jeffrey Wright) and partner Ida (Frances McDormand) farm their isolated homestead – the Western tropes begin. They are apatosauruses (from the genus of sauropods that include the diplodocus and brontosaurus), who we witness plough the land, with their… face. Eh? Yes, head is dragged along the dirt. They are herbivores. We are meant to buy the evolution from eating treetop leaves to growing corn. They have somehow fashioned huge bowls neatly dropping seeds into the furrows. Er… they don’t have opposable thumbs or hands, how did they fashion the bowls? Why are they bothering with corn? Why only corn? Even CARS has more attention to detail. - Arlo, the focus, is timid. Henry establishes himself as a wise role model, telling his children that they must do something bigger than themselves to earn their mark. Of course, Arlo is too weak-kneed to do so, and must learn to be a man-dinosaur to complete the trite character arc. Assigned to kill a “critter” stealing their winter store from the corn silo (yes the apatosauruses have built one), Arlo cannot bring himself to execute the caught human boy thief. Letting him go triggers tragedy. Parental loss is gut-wrenching in the likes of THE LION KING and BAMBI, especially for their surprising inclusion. THE GOOD DINOSAUR signposts demise, not only robbing the moment of pathos but invoking the idea of cynical emotional manipulation. Arlo ends up being swept far away from his home via a powerful river. The plot then kicks in: Arlo’s journey home. How many prehistoric animated films have the arduous trek narrative? Clue: THE LAND BEFORE TIME, DINOSAUR, THE CROODS and ICE AGE. Exactly. Yawn. The odd bods met along the way are so character malnourished as to barely register as cameos. And random. T-Rex cowboys (no way as cool as that sounds), cross-eyed triceratops (no way as cool as Triceracop from KUNG FURY) and brutal pterodactyl baddies – they prey on animals who have survived after storms. What the hell?! In a better project, those villains would have provided the kind of merciless, bottom feeder adversaries who add nightmarish nihilism to the plot. Here, the pterodactyls are an incongruent harshness. 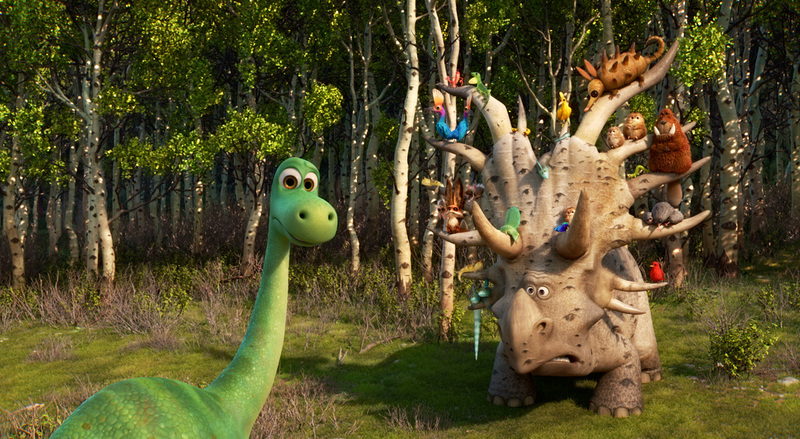 THE GOOD DINOSAUR, a movie as meaningless as its title.